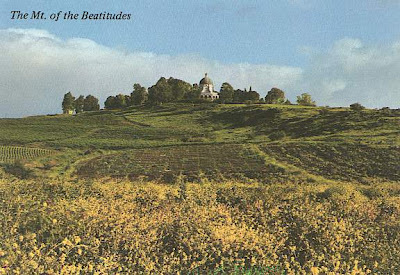 Second Sunday of Lent: "The righteous will shine like the sun"
The Lord "took with him Peter and John and James, and went up on the mountain to pray. And as he was praying, the appearance of his countenance was altered, and his raiment became dazzling white." (Lk 9. 28-29) Why does the Lord reveal his glory to the Apostles in this way? St. Thomas Aquinas teaches that this grace was given to strengthen the Apostles for the Cross to come by giving them a glimpse of the Resurrection which would be purchased only by the blood shed upon the Cross. "For a person to go straight along the road, he must have some knowledge of the end--just as an archer will not shoot an arrow straight unless he first sees the target....This is particularly necessary if the road is hard and rough, the going heavy, and the end delightful" (Summa theologiae, III, q. 45, a. 1). 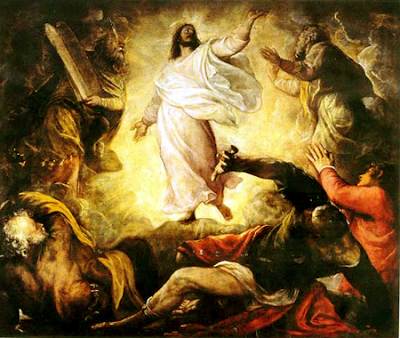 We savor in the Lord's Transfiguration a foretaste of the heavenly glory which awaits the faithful. Our bodies will share in his brightness, "by which the bodies of the saints shall shine like the sun, according to the words of our Lord recorded in the Gospel of St. Matthew: 'The righteous will shine like the sun in the kingdom of their Father' (Mt 13:43). To remove the possibility of doubt on the subject, he exemplifies this in his Transfiguration. This quality the Apostle sometimes calls glory, sometimes brightness: 'He will change our lowly body to be like his glorious body' (Phil 3:21); and again, 'It is sown in dishonour, it is raised in glory' (1 Cor 15:43). Of this glory the Israelites beheld some image in the desert, when the face of Moses, after he had enjoyed the presence and conversation of God, shone with such lustre that they could not look on it (Ex 34:29; 2 Cor 3:7). This brightness is a sort of radiance reflected on the body from the supreme happiness of the soul. It is a participation in that bliss which the soul enjoys....This quality is not common to all in the same degree. All the bodies of the saints will be equally impassible; but the brightness of all will not be the same for, according to the Apostle, 'There is one glory of the sun, and another glory of the moon, and another glory of the stars; for star differs from star in glory. So it is with the resurrection of the dead' (1 Cor 15:4f)" (Catechism of the Council of Trent, I, 12, 13). The Father's command "Listen to him!" means that in Christ we find the fullest revelation of the Father's glory figured forth in the glorious Transfiguration on Mount Tabor. There is no other name, or sign, given under heaven by which we may be saved. "Therefore," according to Saint John of the Cross, "if any now should question God or desire a vision or revelation, not only would he be acting foolishly but he would be committing an offence against God, by not fixing his gaze on Christ with no desire for any new thing. For God could reply to him in this way: 'If I have spoken all things to you in my Word, which is my Son, and I have no other word, what answer can I give you now, or what can I reveal to you that is greater than this? Fix your eyes on him alone, for in him I have spoken and revealed to you all things, and in him you will find even more than what you ask for and desire....Hear him, for I have no more faith to reveal, nor have I any more things to declare' " (Ascent of Mount Carmel, book 2, chap. 22, 5). Saturday, Lent Wk 1: "love your enemies"
Friday, Lent Wk 1: "be reconciled with your brother"
you will not enter into the Kingdom of heaven. Jesus acknowledged the Ten Commandments, but he also showed the power of the Spirit at work in their letter. He preached a "righteousness [which] exceeds that of the scribes and Pharisees" as well as that of the Gentiles. He unfolded all the demands of the Commandments. "You have heard that it was said to the men of old, 'You shall not kill.' . . . But I say to you that every one who is angry with his brother shall be liable to judgment." 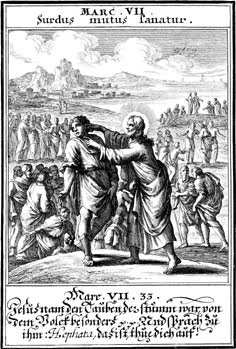 Thursday, Lent Wk 1: "Now help me, O LORD, my God"
“And now, come to help me, an orphan. so that he and those who are in league with him may perish. Through the prophets, God forms his people in the hope of salvation, in the expectation of a new and everlasting Covenant intended for all, to be written on their hearts. The prophets proclaim a radical redemption of the People of God, purification from all their infidelities, a salvation which will include all the nations. Above all, the poor and humble of the Lord will bear this hope. Such holy women as Sarah, Rebecca, Rachel, Miriam, Deborah, Hannah, Judith and Esther kept alive the hope of Israel's salvation. The purest figure among them is Mary. Wednesday, First Wk Lent: "an evil generation seeks a sign"
but no sign will be given it, except the sign of Jonah. Tuesday, First Wk Lent: "do not babble like the pagans"
First Sunday of Lent: "Christ was led by the Spirit into the desert"
Why do we undertake this forty day period of abstinence from meat on Ash Wednesday and all the Fridays of Lent? Why do we fast on Ash Wednesday and Good Friday? We recollect and meditate, by these forty days of fast, abstinence and prayer, upon Christ's victory over temptation. We grow in our faith that, by the graces of the sacramental life, our intellect and will is strengthened so that we may keep God's commandments in love for Him as Christ first did. In Christ's temptations are summed up every temptation which we might face. "Scripture would not have said", according to St. Thomas Aquinas, "that once all the temptation ended the devil departed from him, unless the matter of all sins were included in the three temptations already related. For the causes of temptation are the causes of desires -- namely, lust of the flesh, hope of glory, eagerness for power" (Summa theologiae, III, q. 41, a. 4 ad 4). 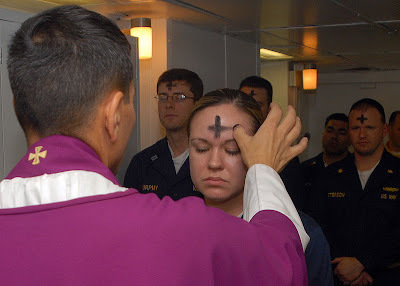 Saturday after Ash Wednesday: "If you hold back your foot on the sabbath"
Sunday is expressly distinguished from the sabbath which it follows chronologically every week; for Christians its ceremonial observance replaces that of the sabbath. In Christ's Passover, Sunday fulfills the spiritual truth of the Jewish sabbath and announces man's eternal rest in God. For worship under the Law prepared for the mystery of Christ, and what was done there prefigured some aspects of Christ: Those who lived according to the old order of things have come to a new hope, no longer keeping the sabbath, but the Lord's Day, in which our life is blessed by him and by his death. God's action is the model for human action. If God "rested and was refreshed" on the seventh day, man too ought to "rest" and should let others, especially the poor, "be refreshed." The sabbath brings everyday work to a halt and provides a respite. It is a day of protest against the servitude of work and the worship of money. 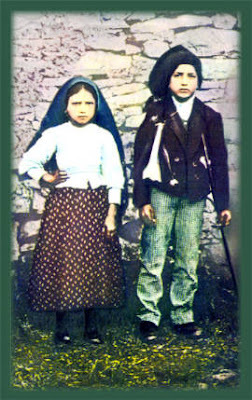 Image: Blesseds Jacinta and Francisco Marto, pray for us! Friday after Ash Wednesday: "make your voice heard on high!" Thursday after Ash Wednesday: "Choose life"
heeding his voice, and holding fast to him. The way of Christ "leads to life"; a contrary way "leads to destruction." The Gospel parable of the two ways remains ever present in the catechesis of the Church; it shows the importance of moral decisions for our salvation: "There are two ways, the one of life, the other of death; but between the two, there is a great difference." Tuesday, Wk 6, C: "God is not subject to temptation"
and he himself tempts no one. This petition goes to the root of the preceding one, for our sins result from our consenting to temptation; we therefore ask our Father not to "lead" us into temptation. It is difficult to translate the Greek verb used by a single English word: the Greek means both "do not allow us to enter into temptation" and "do not let us yield to temptation." "God cannot be tempted by evil and he himself tempts no one"; on the contrary, he wants to set us free from evil. We ask him not to allow us to take the way that leads to sin. We are engaged in the battle "between flesh and spirit"; this petition implores the Spirit of discernment and strength. Monday, Wk 6, C: "let perseverance be perfect"
... so that you may be perfect and complete, lacking in nothing. But if any of you lacks wisdom, 4 he should ask God who gives to all generously and ungrudgingly, and he will be given it. But he should ask in faith, not doubting, for the one who doubts is like a wave of the sea that is driven and tossed about by the wind. When we share in God's saving love, we understand that every need can become the object of petition. Christ, who assumed all things in order to redeem all things, is glorified by what we ask the Father in his name. It is with this confidence that St. James and St. Paul exhort us to pray at all times. SIXTH Sunday, C: "Blessed are the poor"
Some refuse to believe in God saying that the evil in the world, including the physical evils of hunger and thirst, would not be permitted by a good God or at least would be brought to an end by Him. The mystery of evil and in particular the senseless suffering of the poor, the rejected, the excluded, and the persecuted, must be understood within the whole context of God's plan, which is for our happiness. God does offer the eternal communion of His life and love to all. But this promise cannot be consummated in this world which began at a point in time and someday will end. 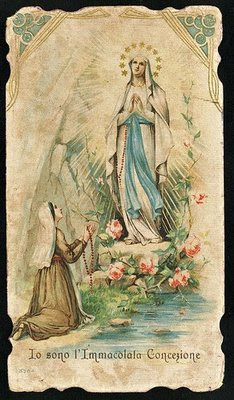 As Mary told Bernadette at Lourdes,"I cannot promise you happiness in this life, only in the next." The happiness of the new heavens and the new earth which God will reveal at the end of the world is offered to all through Jesus Christ our Lord. No man or woman is excluded from the redeeming embrace of God's love. For this reason the Christian message is truly good news for all, including the poor and downtrodden. But this truth does not dispense anyone, and in particular Christians, from the demands of charity and justice for the relief and care of the poor here and now. We are commanded not simply to tolerate or accommodate the poor, not simply to feed and clothe them. Rather we are commanded to love them as we love ourselves. Hunger, thirst, nakedness and homelessness are physical evils and sources of suffering. But these things are not the worst conditions that the human person can experience. The lack of love manifested by cultural and religious poverty, as Mother Teresa taught, is the greatest poverty today: "It is poverty to decide that a child must die so that you may live as you wish." A profound poverty of the heart underlies the many attacks against innocent, defenseless human life today in abortion, partial-birth infanticide, embryonic stem-call research and contraception. The greatest poverty afflicting the human race today is the "cult of death" which, through abortion and abortifacient contraception, denies a child the right to live, laugh and love. Those who promote the "cult of death" suffer a most insidious poverty, a silent killer, which eclipses that love for even the smallest and weakest of human persons without which no one can enter into eternal joy. Defenders of human life rejoice, on the other hand, in the promise of the Lord for those who feed, clothe, shelter and otherwise defend the lives of the "least of these little ones": "Enter into the joy of your Lord. Enter into the kingdom prepared for you from the foundation of the world." Saturday, Wk 5, C: "taking the seven loaves he gave thanks"
... broke them, and gave them to his disciples to distribute,and they distributed them to the crowd. 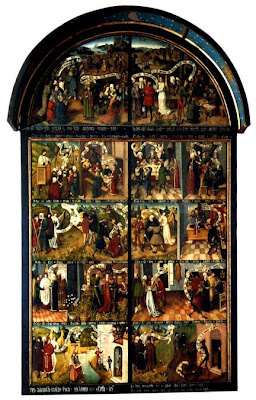 "The Lord's Supper", because of its connection with the supper which the Lord took with his disciples on the eve of his Passion and because it anticipates the wedding feast of the Lamb in the heavenly Jerusalem. The Breaking of Bread, because Jesus used this rite, part of a Jewish meal when as master of the table he blessed and distributed the bread, above all at the Last Supper. It is by this action that his disciples will recognize him after his Resurrection, and it is this expression that the first Christians will use to designate their Eucharistic assemblies; by doing so they signified that all who eat the one broken bread, Christ, enter into communion with him and form but one body in him. Friday, Wk 5, C: "people brought to Him a deaf man"
... who had a speech impediment and begged him to lay his hand on him. Signs taken up by Christ. In his preaching the Lord Jesus often makes use of the signs of creation to make known the mysteries of the Kingdom of God. 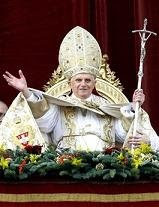 He performs healings and illustrates his preaching with physical signs or symbolic gestures. He gives new meaning to the deeds and signs of the Old Covenant, above all to the Exodus and the Passover, for he himself is the meaning of all these signs. Our Lady of Lourdes: “Let the children be fed first." "The most Blessed Virgin Mary was, from the first moment of her conception, by a singular grace and privilege of almighty God and by virtue of the merits of Jesus Christ, Savior of the human race, preserved immune from all stain of original sin." 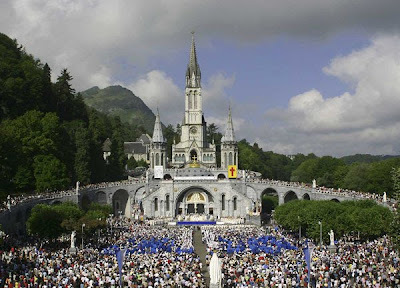 Images: Holy card commemorating the apparition of Our Lady to Bernadette at Lourdes and pilgrims on the esplanade of the sanctuary at Lourdes. Tuesday, Wk 5, C: "Honor your father and your mother"
you allow him to do nothing more for his father or mother. in favor of your tradition that you have handed on. He was obedient to them. The fourth commandment opens the second table of the Decalogue. It shows us the order of charity. God has willed that, after him, we should honor our parents to whom we owe life and who have handed on to us the knowledge of God. We are obliged to honor and respect all those whom God, for our good, has vested with his authority. Art: Decalogue, St. Mary's Church, Gdansk. 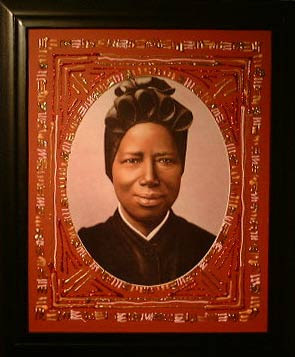 S. Josephine Bakhita: "the cloud filled the temple of the LORD"
... so that the priests could no longer minister because of the cloud, since the LORD’s glory had filled the temple of the LORD. Cloud and light. These two images occur together in the manifestations of the Holy Spirit. In the theophanies of the Old Testament, the cloud, now obscure, now luminous, reveals the living and saving God, while veiling the transcendence of his glory - with Moses on Mount Sinai, at the tent of meeting, and during the wandering in the desert, and with Solomon at the dedication of the Temple. In the Holy Spirit, Christ fulfills these figures. The Spirit comes upon the Virgin Mary and "overshadows" her, so that she might conceive and give birth to Jesus. On the mountain of Transfiguration, the Spirit in the "cloud came and overshadowed" Jesus, Moses and Elijah, Peter, James and John, and "a voice came out of the cloud, saying, 'This is my Son, my Chosen; listen to him!'" Finally, the cloud took Jesus out of the sight of the disciples on the day of his ascension and will reveal him as Son of man in glory on the day of his final coming. Fifth Sunday, C: "Put out into the deep"
Our lives in Christ depend upon an unlimited trust in the Lord, following his words with energy and hope even when his will for us leads into uncharted waters, when he commands that we "put out into the deep", even those well-plumbed depths which have in the past yielded up for us only empty nets. Simon Peter responded with weariness, "Master, we toiled all night and took nothing", when our Lord commanded him "Put out into the deep and let down your nets for a catch." (Lk 5, 4-5) He had good reason to believe that after all of his valiant efforts he would come up empty again. You and I, too, have tried again and again to keep the Lord's commands, and sometimes have failed. We also respond sometimes with weariness when he reminds us to keep all the things that he has commanded. We too wish sometimes to persuade him to release us from the burdens of commitment, of thankless labor, of frightening and overwhelming situations. Peter, though wearied with trying, says a remarkable thing for, even after complaining hesitation, he responds with the divine power of faith: "But at your word I will let down the nets." (Lk 5, 5) He responds in obedience and trust, though he had no earthly reason to believe his efforts would be crowned with success. 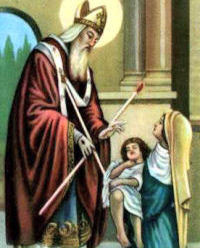 Peter's faith and trust is rewarded with the miraculous draught of fishes. In awe at his encounter with the mysterious presence of the living God, he falls down in worship before Jesus, exclaiming, "Depart from me, for I am a sinful man, O Lord." (Lk 5, 8) He is unworthy before the thrice-holy God perfectly revealed in Jesus Christ. Though we never refuse the grace of Confession and absolution when conscious of serious sin, we are yet aware that we must ever depend upon regular reception of the Lord's Body and Blood for the forgiveness of our venial sins. 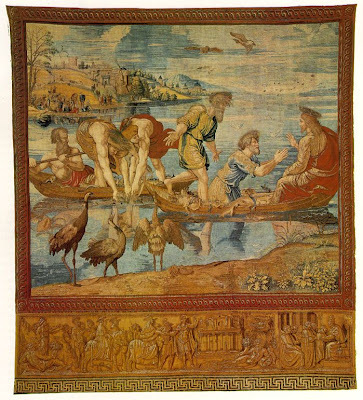 Art: Rafael, Miraculous Draft of Fishes, tapestry. Thursday, 4th Wk, C: "the way of all flesh"
Take courage and be a man. 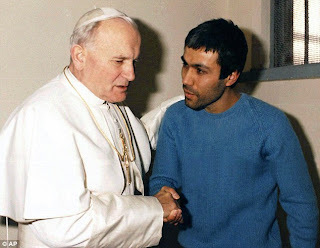 S Blase: “A prophet is not without honor except in his native place"
Monday, 4th Wk, C: “Legion is my name"
Satan or the devil and the other demons are fallen angels who have freely refused to serve God and his plan. Their choice against God is definitive. They try to associate man in their revolt against God. 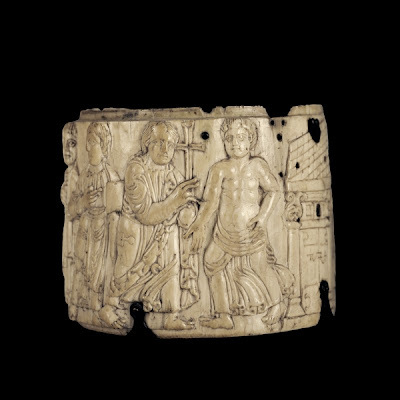 Art: Ivory pyxis with the Healing of the Demoniac, Carolingian, early 9th century AD. From Aix-la-Chapelle (Aachen, Germany), court school of Charlemagne, British Museum.